Hawaii's Amanda Garza watched as one of three homers hit by Fresno State's Christina Clark left the stadium yesterday. Fresno State got another All-America performance yesterday, but it wasn't from ace Jamie Southern. Behind the amazing hitting of shortstop Christina Clark, the 16th-ranked Bulldogs won the first game of a doubleheader 5-2 before Hawaii rebounded to take the second game 4-0. Fresno State (36-13, 9-1) leaves with a blemish on its Western Athletic Conference record but took the series 3-1. With the split yesterday, the Rainbow Wahine improved to 22-22 and 4-3. An afternoon crowd of 207 at Rainbow Wahine Softball Stadium was treated to a brilliant performance from Clark, who made hitting home runs look mundane. The sophomore finished 3-for-4 with three home runs and four RBIs. The All-American set a WAC record as she took over the Bulldogs' single-season record for home runs (18), which she had shared. Clark bombed a solo shot to left field on Melissa Coogan's first pitch of the game. Clark's second jack went to the opposite corner in right and helped Fresno tie the game at 2-2 in the fifth inning. Her two-run shot in the seventh broke the tie and lifted the Bulldogs to the victory. "We were in that game. Unfortunately, I didn't produce well enough to keep the lead," said Coogan, who equaled her season high in strikeouts (eight) and home runs given up (four). "We scored two runs in the first inning. We don't really need much to win a ball game. I just didn't have it today. "It was just those pitches. ... Christina Clark is a really good hitter. The first home run, I basically served it up for her. The second one, I threw a rise ball and she stuck her bat out there. I don't know how she hit that." Clark's performance is what she expects of herself. The three-time WAC Player of the Week made an argument for national honors. "I saw the ball well all weekend," said Clark, who had five home runs in two days. "Coming into this weekend, it was an important four games for our team. "I knew I had to get things done for our team and lead the way. ... It's a good feeling going out there knowing that you're the last player to hit the RBI in. I like it (the pressure)." Hawaii started strong in the bottom of the first with back-to-back singles from Tracie Uchima and Denise Dahlberg. April Crowell was hit by a Southern pitch to load the bases. Tyleen Tausaga's RBI single brought Uchima home, and Dahlberg scored on Noelle Izumi's infield single for a 2-1 lead. Clark's home runs overshadowed a decent recovery by Coogan (8-12), who was hammered by Fresno on Friday night but went the distance yesterday. Shasta Lewis doubled to center to lead off the seventh and Clark followed with her third bomb of the day. 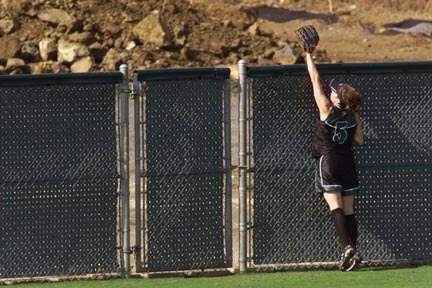 Coogan retired the next batter, but catcher Nichole Willis ripped a 3-2 offering over the center-field fence. It was Willis' second in two days. "I made a decision to go with Coogs, figuring she was going to be better," said Hawaii coach Bob Coolen, who considered starting Paula Blanning. "To give up the three, four home runs, that was a killer." Blanning brought the Wahine back in the second game. The sophomore scattered five hits, struck out three and made a statement for additional playing time. Blanning had made only seven appearances this season prior to last night's start. She was effective in relief on Friday and Coolen said yesterday's performance earned her a larger role in upcoming games. It helped that Blanning got some early support from Dahlberg, who drove a 2-1 pitch from Laura Ferreira over the left-field wall for her sixth home run of the season. "She made a mistake and I took advantage of it," said Dahlberg, who was 2-for-3 with an RBI in the second game. "I don't know what she was trying to throw, but she threw the ball and my eyes got big. It was magic. It was great." Hawaii added three more runs in the bottom of the sixth. Dahlberg singled to center and raced home on a fielder's choice. With two on and two out, Izumi slapped a double to right-center field to score Crowell and Tausaga. Blanning retired the final three Fresno hitters in the seventh for the win. "We all knew we could beat their other pitcher. All weekend there's been this anticipation to see someone other than Jamie Southern," Coolen said. "Today was just a matter of a different timing. She doesn't throw bad. She just doesn't throw like Jamie Southern. When the other pitcher got out there, we were like, 'We're ready. We've had enough of this.' "
Hawaii leaves Wednesday for a 10-day road trip. The Wahine play two games at Tulsa (Sunday and Monday) and follow with two at Nevada.